With it’s mild, fragrant flesh and creamy texture this small squash is fantastically easy to prepare: just bake and eat it skin and all, no need to peel. The Delicata’s elongated shape lends itself to using as you would a marrow. Try cutting it into thick discs and stuffing the hole with fragrant rice or spiced lamb. 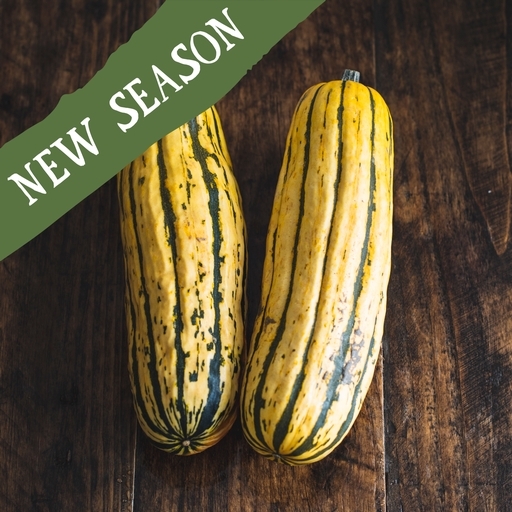 The Delicata squash doesn’t need peeling. To prepare, just scoop out the seeds with a spoon and chop the flesh as desired (chunks or wedges about 2.5cm wide work well for roasting). Never put a squash in the oven whole – it may explode! Rub your squash pieces with a generous amount of olive oil, and a sprinkling of chilli or ground spice if you like. Roast at 200°C/Gas 6 until tender and caramelised. The seeds can be roasted for an excellent healthy snack, or to add crunch to salads. Separate the seeds from the pulp and toss them with a little oil and salt or soy sauce. You can add flavours, such as spices, honey or dried herbs. Spread over a baking sheet and roast at 160°C/Gas 3 for 10-15 mins, until crisp and lightly golden. Once cool, the roasted seeds will keep in an airtight container for a week or so. Squash like to be kept dry and warm, at room temperature. They should be happy on a kitchen shelf or windowsill for up to a few months – and they make a colourful autumnal display until you’re ready to eat them. Once you’ve cut your squash, keep the remainder in the fridge and use within a week. These squash are grown at Bedlam Farm in Norfolk.